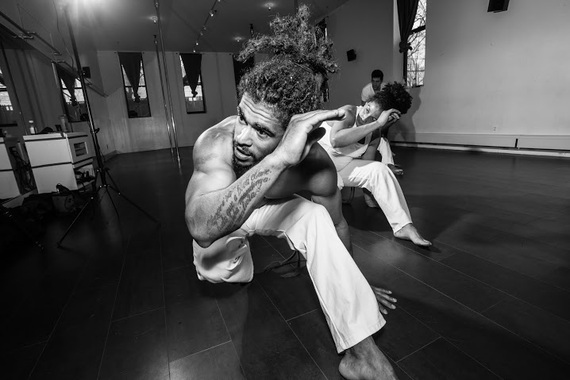 On June 18th, 19th and 20th, 2015, the Ginga Mundo school of the Brazilian martial art Capoeira will be hosting a Batizado (or "baptism") at Essex Street Academy, 350 Grand Street, Manhattan, along with performances and workshops that are open to all schools as well as open to the public. The event is co-hosted by Ginga Mundo Instructor Pena Verde, Professora Pimentinha, and world famous Capoeira Mestre (or Master) Sabiá, coming directly from Bahia, Brazil. 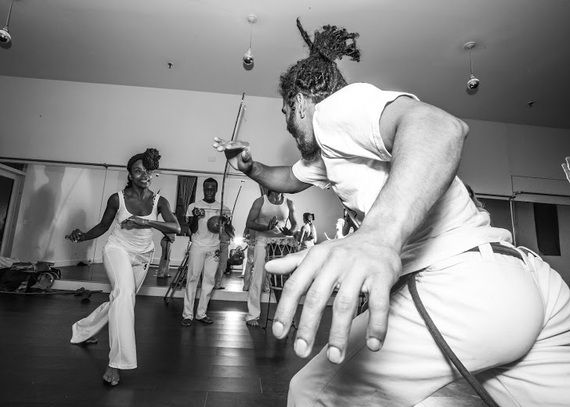 Capoeira -- pronounced "capo-wey-da" -- is an Afro-Brazilian martial art that combines dance, music, percussion, songs, self-defense techniques and acrobatics. According to legend, Capoeira began over four centuries ago when African slaves in Brazil trained to fight under the guise of dance in order to fool their masters and liberate themselves. Graceful sweeps and cartwheels performed to rhythmic drumming concealed their deadly techniques of attack, defense and trickery...and a totally one-of-a-kind martial art emerged. 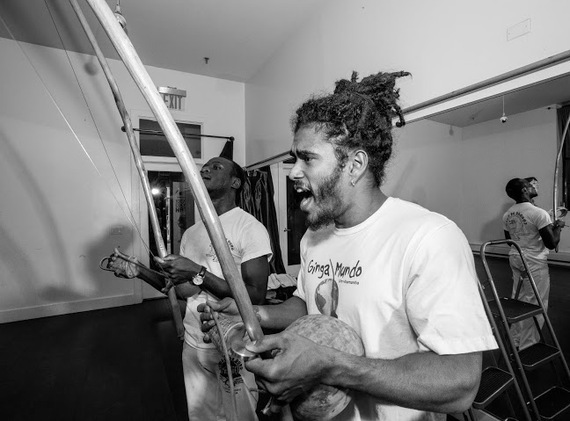 Capoeira is played in a circle, called a roda (pronounced "hoda") to the sound of live music -- specifically songs written for the sport, and instruments (the Berimbau, the Atabaque, the Pandeiro and the Agogô) which determine the rhythm, pace and style of game that is played. 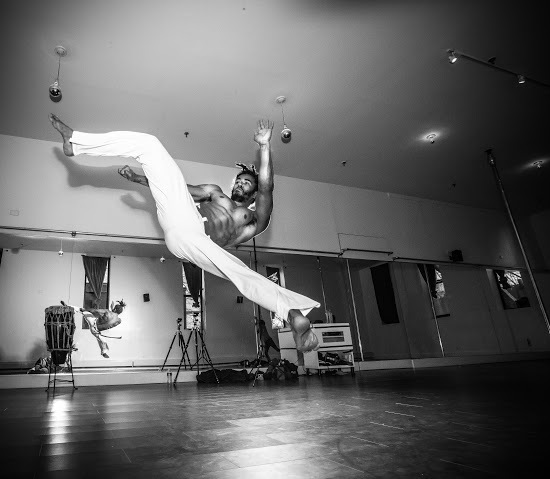 Capoeira is, in a word, beautiful, and mesmerizing to watch. There is a joyful and playful spirit to Capoeira (in fact, in Portuguese you joga or play Capoeira) and, because it utilizes dance and acrobatics and players don't just punch, kick and hit each other, there is a mystery and magic to the martial art that make it truly unique. However, Capoeira is also a dangerous martial art of deception and trickery in which the whimsy of a smiling Capoeirista (as practitioners are called) performing an acrobatic movement (referred to as Floreios -- or flourishes -- in the sport) can turn on a dime into a powerful kick to the torso or take down at the heels that sends the opponent flying across the roda and landing ingloriously on their back. If a real fight has broken out (which can happen amongst the professional ranks) it will lead to real injury. 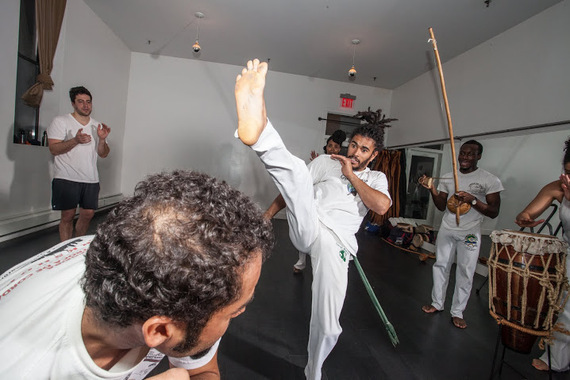 This is a part of what is referred to in the sport as Mandinga, which is the trickery and deception that is central to a powerful Capoeira game because the most successful attempt to kick or take-down your opponent is the one they don't see coming. Of course, nothing as spectacular as Capoeira comes easy. Unlike many other ancient physical arts that have been commercialized and watered down (think of 6 week online Yoga teaching certificates and Karate Black Belts given out at strip malls) Capoeira has stayed true to the historical standards, thresholds and rigor that make it so spectacular. 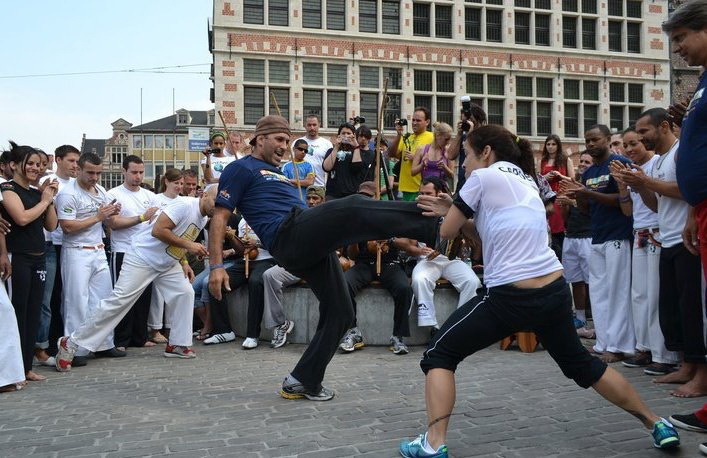 No amount of money can pay for a rank - it must be earned through years of training - and there are very few Capoeira masters in the world, and those few who have achieved it have devoted their entire lives to the art. But like any great achievement, gaining any real skill and rank in Capoeira is worth it. And the rigor and rewards can be seen at Pena Verde's classes. Capoeiristas coming to play in the Batizado rodas are asked to purchase an event t-shirt for $25.